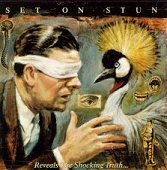 In Music We Trust - Set On Stun: Reveals The Shocking Truth! Let's start from the top, because this band makes my head spin! Set On Stun is a "hard to find the right word to describe what the hell I'm experiencing" type band. I say this is a good way. Other than the fact that their band's title is nostalgic (ex. Beam me up Scottie! ), this band will soon have to call themselves Set On Kill! At first, I was stunned, but as I turned the music up; I underwent a pleasant earth-shattering near-death experience. Someday, I expect to be happily put out of my misery. I haven't heard a band like this in a long time. Their sound borders on head-banding type music, punkish; with a popish rock feel. Nice combination. There are quiet moments that calm, and then ear splitting romps that are thrilling to jump in shock to. And if you don't drop the liner notes while listening, the artwork on "Reveals The Shocking Truth!" is amazing! The lyrics are scribbled out, and that's enough to give one a headache, but it's worth it! Reading the lyrics in addition to hearing them sung, is a totally different trip. "Listen to me! Crack this simple shell, Emancipate yourself, Don't ask why, Temper your concerns, diamonds will turn to dust, leave them behind, swallow to release." ~ Jonestown Punch (#6 track on this CD). Set On Stun is a quartet. Tim Okamura is in charge of vocals. More vocals and bass is headed by Dakota Gallivan. Drums and percussion are taken care of by Robert D'Amico, and Jeff Steinhauser plays guitar and is responsible for "science". Science? Ok. I can only imagine this means that he is the genius who makes the music sound "techno" when it's not sounding "grungy". This band hails from New York, but they traveled to Arlington, VA to do some of the recording of this release; at Inner Ear Studios with producer, J. Robbins of Jawbox. But first they worked with Martin Bisi (Sonic Youth, Helmet, Cop Shoot Cop) in Brooklyn to record the last four tracks of this release. This band came to be, counting four of themselves in an apartment in Brooklyn, on a hot August day in 1995. Their bio was quite amusing, and accents their music well. They all seem like a down-to-earth crazy-to-the-max type bunch. Can't get any better than that! They dig the music, and that's what counts. It's what makes their sound believable. And after gigging through New York clubs, and hard work that led them to the present; their first release is solid and creative. But 10 songs in 40 minutes just isn't enough for me. So I'm asking for more! The first song had me jumping immediately. Rushing The Growler is a very powerfully riffed melodic body-grinding intro to this compilation. Ill Gift/Infusion slips in without notice, and sheds some nice lead guitar work that hypnotizes. The vocals always lay low and swim through all the songs. Tim has a nice voice; light and calming when it needs to be, and growling and forceful at the right times. Chronic Projector shares the same kinds of riffs and percussion as the last song. I almost thought to myself, "Hey! Don't get boring on me!" But that changed quickly with the drum work, which led to some decent rhythm lines that made this song transform. Tim sings to us softly, beginning The Curtain Drops On the Imposter; and then blends into the music again. This song is stimulating, and gives me some chills ala Alice In Chains and Nirvana, just a little. Derived From The Wire Fist is a very powerful tune. The lead guitar is still using some similar riffs from the previous songs, a high pitched wrenching that is effective but gets a little nerving. The lead is good, don't get me wrong, but I can picture is being a lot more intense. I say this because the lead riffs are solid, and left me craving more. The song, Jonestown Punch, follows. I like this song, but it's still pushing out some of the similar lead riffs. The grungy Wreckage is a metal head's delight. Quick attacks and vocals, killer drums, awesome rhythm, bass and lead. This is where Martin Bisi's influence comes shining through. This song is down-right spectacular, and should be picked as a single. District Of Columbia is a poppy song with lots of fast drum work that is noticeable, but not overbearing. Bulletproof Vest shows some science, with a cool electric "geetar" intro. Then is makes your body move. This is another "single material" tune blasting some amazing things from every corner. The last song, Still Working, No Progress, starts out soft and gentle and then rips your ears apart. But that's ok, again, it's worth it. After listening to this band, I've become a fan. I believe they have huge potential. They are very creative, and they could get a whole more creative. So I look forward to another release. I give "Reveals The Shocking Truth!" a B+. I would have given them an A if Bisi, along with Set To Stun, produced the whole thing. No offense, but the CD kicked into overdrive at the end. It's just my observation.